The Town of Mentone, located in Kosciusko County, Indiana, is known as the “Egg Basket of the Midwest” because of the commercial egg production in the region. With just over 1,000 residents, Mentone is a typical small town, and faces challenges common to many other small communities in North America with the dilemma of an aging lagoon-based wastewater treatment facility and new effluent quality limits. Mentone’s existing wastewater treatment facility consisted of a two-cell facultative lagoon system providing secondary treatment. 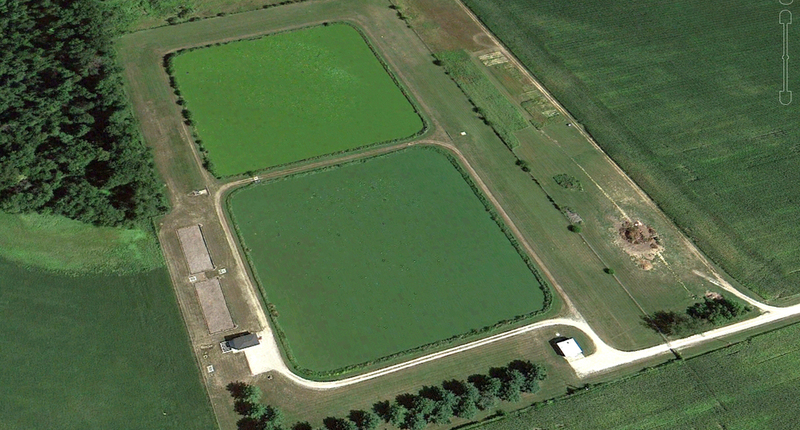 This facility was designed to meet effluent BOD5/TSS limits of 25/70 mg/L, but was unable to meet the required National Pollutant Discharge Elimination System (NPDES) limits for Total Ammonia-Nitrogen (TAN) of 9.6 mg/L in summer and 10.4 mg/L in winter. Mentone, like a majority of small communities in North America, was left with no choice but to upgrade their WWTP. Until recently, mechanical plants were the only upgrade alternative that can meet low nutrients, BOD5 and TSS limits on a year round basis. Mechanical plants require a large infusion of capital for construction, operation and maintenance. The alternative to these costs prohibitive upgrades is to remain non-compliant, which is not an option. 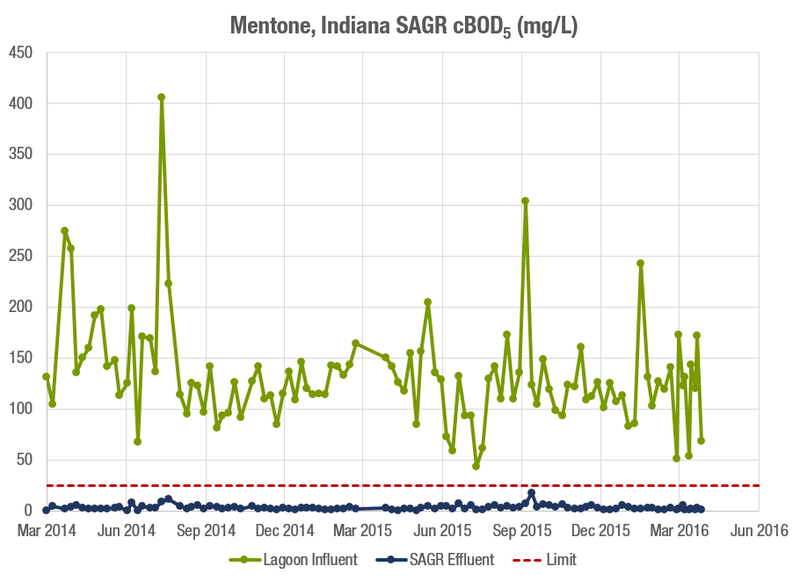 Mentone, Indiana's lagoon-based wastewater treatment facility with SAGR post-lagoon nitrification. In collaboration with the town’s engineering consultant, Nexom designed an upgraded system utilizing the existing facultative lagoons in series followed by a SAGR for post-lagoon nitrification (ammonia converted to nitrates) and BOD/TSS effluent polishing. Mentone’s SAGR system consists of two gravel beds each capable of handling 100% flow in the summer in the rare case that maintenance would have to be performed within a single bed. No changes were made to the facultative lagoons infrastructure. In Mentone, no aeration was required in the lagoons to meet the recommended lagoon effluent BOD5 feeding the SAGR process. The upgrade was completed without acquiring additional land, or taking either of the existing lagoon cells off-line. The blowers for the SAGR are sized to meet the oxygen requirements for nitrification and final BOD polishing only. This translates to significant energy savings that would otherwise be required to run blowers for a conventional aerated lagoon system. It is estimated that 50% energy savings are realized with this design compared to other systems achieving similar effluent quality. The trade-off is the higher lagoon footprint required for the necessary residence time. Since the capacity was available at the onset of the system design, utilizing the existing infrastructure was deemed the most cost effective approach. Utilizing the existing lagoons provided cost savings both in the construction and long term operation and maintenance of the system. Nexom provided system commissioning and operational training on March 24, 2011. Following a two week startup window, the effluent quality from the Mentone facility is meeting TAN, BOD, and TSS NPDES permit requirements on a year round basis. The system design flow is 0.12 MGD (454 m3/day). 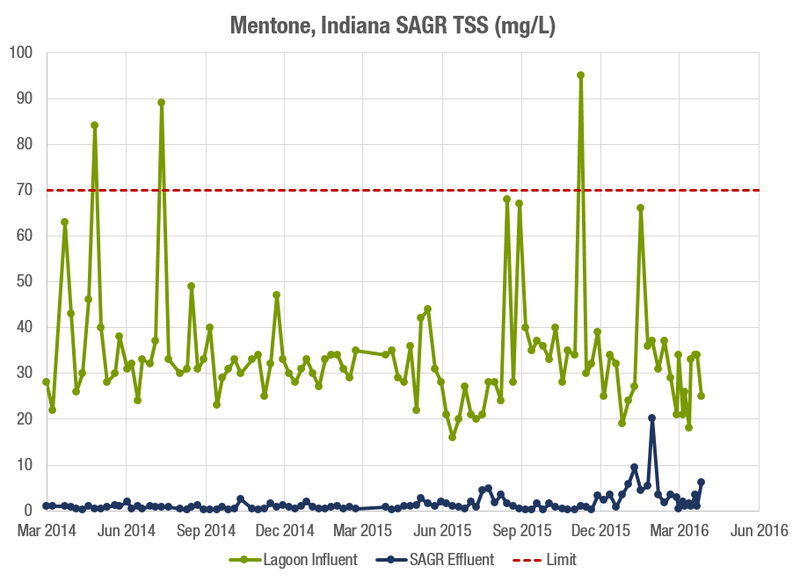 The upgrade of the facility utilizing the SAGR process enabled the Town of Mentone to not only meet but surpass current NPDES requirements. Utilizing the facultative lagoons for secondary treatment by the SAGR process for nitrification and BOD/TSS polishing will lead to an estimated 50% operation and maintenance savings compared to a fully mechanical aerated treatment system. The upgraded system in Mentone, IN provides an example of a cost effective and efficient solution for WWTP operators in North America who face the same regulatory challenges, and want to keep their existing lagoon system while maintaining low operation complexity.